Why are cable suspended systems used for retail marketing and commercial advertising? 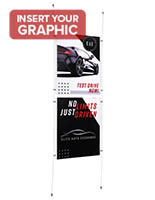 A hanging graphic display provides an adaptable and versatile merchandising platform that will suit the individual needs of differing organizations and businesses. The cable suspended system is perfect for use in storefront windows and effectively catches the attention of prospective customers as well as passersby. These types of tools are intended to bolster sales and increase traffic without breaking the bank, which is why affordable pricing is standard. This cable suspended system includes all of the hardware and fittings required for a taut ceiling to floor setup. The kit is both modern and space-saving, as to leave room for other promotional materials or store fixtures. This cable suspended system, also known as a rod wire suspension set, is equipped with long-lasting mounts and panels that call for little to no upkeep once installed. 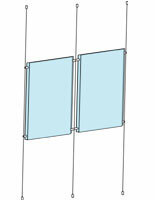 The transparent acrylic panels are frameless in design, which provides a simplistic demonstration. This cable suspended system is also the largest version offered, so signage is easier to see and onlookers are sure to notice all the information. The contemporary styling is ideal for all kinds of different environments, so check out the whole selection to find an optimal exhibit solution for your institution. How can companies successfully implement cable suspended systems? Highly visible sign fixtures are essential to effective advertisements. These units have inventive designs that attract the eyes of customers no matter where they are put up. In addition, the minimalist layouts ensure viewers are focusing on inserted content rather than the frames. Most locations use the suspension kits to highlight specific merchandise, services, or offerings. Retailers often advertise the latest additions or upcoming sales. Real estate agents are able to feature a variety of property listings at one time. Restaurants share daily specials and drink menus because the units are completely updateable. Art galleries develop entire hanging exhibits with these supplies. Many users set up a display in a window to advertise outside of a store. What is great about this application is that double-sided sign inserts can be used to promote information on the inside at the same time. Other arrangements include placement alongside a wall or installation in the middle of a sales floor, with the inside lighting helping to place the focus directly on the suspension kits. Some associations even consolidate several units to develop individualized presentations. All too often, the most original marketing supplies get the client and the sale, so why not take advantage of one of the dynamic sign solutions? Any of these art exhibits complements a store front window perfectly. The sign matrixes are a great alternative to similar griplock designs that are typically more complicated and expensive. These models feature simple designs that are economical and easy-to-use. Why fiddle around with overly-involved griplock components when you can avoid the hassle with these packs? Each bundle comes with all the necessary mounting hardware. This includes rod wires, acrylic panels, panel grip clamps, floor standoffs, and ceiling standoffs. 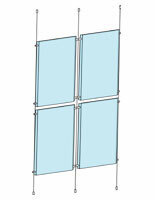 Once the unit has been erected, users can choose just how high to mount the panels for the most prevalent display. Why buy from this online hardware company as opposed to a competitor? The kits depicted here include custom hardware and sign panels for very unique showcases. Each system comes with everything needed, so customers can revel in effortless one-stop-shopping. The wide selection of options and accessories allows for shoppers to locate the items they need with ease. Additionally, purchasers are able to add on to existing units, so creating targeted marketing campaigns is no problem. Faster lead times are another benefit of our excellent shipping department. Merchandise ordered prior to 2 p.m. EST Monday through Friday ships the same day when in stock. Wholesale prices are not only more affordable to every client, but also many buyers reap the savings of bulk quantity purchases. When store owners and advertisers are in the market for sign holders and window displays, they need not look further than this extensive web inventory. The collection supplies those on relatively limited budgets with affordable equipment without sacrificing high quality craftsmanship. The versions in this category hold either 18" x 24" or 22" x 28" inserts. 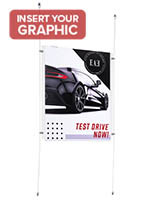 Larger poster holders are better at grabbing the attention of possible clients, which is why these units are so popular. Another fantastic trait of these models is their compact configurations. They are able to save space while showing tons of information simultaneously. Most other signage fixtures do not provide such capabilities. With these styles, floor or wall areas can be left open for other retail or advertising tools. Furthermore, printing up new or replacement promotional materials is often a costly expense, which is why a showcase like this one is so ideal! Some businesses and institutions even print out their own posters to develop custom in-store or store front presentations in no time.